Let’s start with a simple truth about the HomePod: if you’re aren’t an iOS device owner and user of Apple Music or iTunes Match, it isn’t for you. Unlike the Amazon Echo, Google Home or Sonos One, it’s entirely reliant on you having an Apple device to make it function AT ALL, let alone play music. 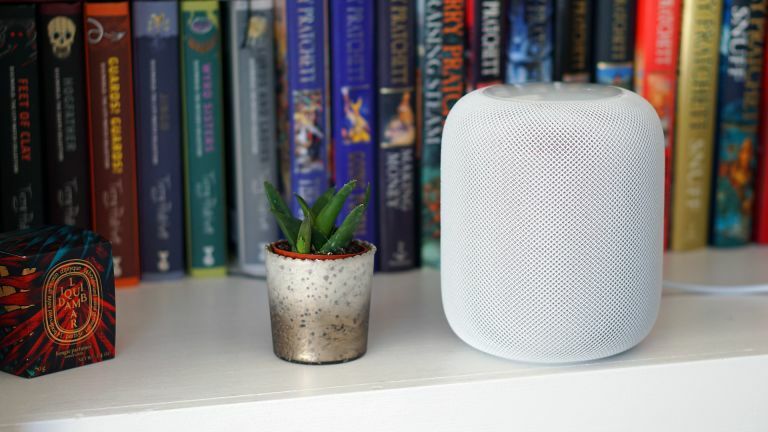 But if your household is kitted out with iPhones, and you’re into music (and Music) and in the market for a speaker that sounds fantastic and has a few voice-controlled extras to boot, then it could be that the HomePod extremely IS for you. At just seven inches tall, the HomePod isn’t overbearing at all. Its black or white mesh outside is nondescript, and it doesn’t offer the design flourish of the fabric or wood veneer coating of the likes of the second-gen Echo. It does show that you don’t really need those extras to fit in well in a home, though – it’s probably the smart speaker that looks least like a tech item despite its classic Apple whiteness. In fact, it has more in common with the Sonos One, but with more sensuous curves. It’s really easy to set up: just plug it in, then place your iPhone near it. Your HomePod can then pull everything from your Wi-Fi password to your iCloud details from your phone directly. The top of the HomePod has a hazy dot of light that swirls in multicolours to indicate Siri is active, like HAL took the weekend off for Mardi Gras. When it’s playing music, plus and minus signs appear for manually changing the volume. You can tap the centre to pause and play, hold to invoke Siri, and triple tap to skip a track. It’s less overtly futuristic than the Echo’s circling light and rotating top, but we like both approaches. That HomePod starts off by taking you into music is smart, because sound quality is absolutely its stand-out feature. Apple says the engineering has been years in the making, and it was worth it for this result. The HomePod’s musical showpiece is its knack for detail. With vocals, acoustic guitar, cymbals and similar elements that have a lot of fidelity to lose or gain depending on the quality of your speaker, it’s almost untouchable compared to similar gear. This may well be down to Apple's vaunted 'room-sensing' tech. Sound reflections can create a kind of cross-talk when you’re listening to music, muddying the finest detail in a recording. Good compensation should bring that back out, and the HomePod’s room compensation is very good indeed. It’s not all about those higher-end acoustic acrobatics, though. The HomePod is solid through the mid-range for its size, and impresses when it comes to bass. The small size of the speaker puts a certain limit on how much bass there can be, but the upward-firing woofer isn’t afraid to let you know it’s there. You won’t feel the vibrations in your chair the way you might from a bigger speaker, but that it puts out a sound as full as it does is kind of astonishing. HomePod comfortably bests the other smart speakers of its size for sound quality, but then it does cost a lot more than them, so you’d hope so. We put it against a Libratone Zipp, too, which is close in price and size, and actually comes close to the HomePod for a vibrant top end, but completely fails to match it for mid-range and bass. We tried it against a Naim Mu-so Qb next, which is one of the best Wi-Fi speakers on the market. The Mu-so Qb is bigger, and so takes the HomePod to school when it comes to impact, poise and fullness across the bass and mid-range, but actually the HomePod still has it beaten for clarity and offers a sweeter high end. Which you prefer would probably come down to the kind of music you like, so we’d call it a draw between them. But the Naim costs around double what the HomePod does – that’s how good Apple’s little speaker is. Having two HomePods on each side of the room working in stereo would be even better, but this, along with multi-room AirPlay 2 support, isn’t present at launch. Apple has demoed it to us, though, and it’s ridiculously powerful. So yes, at launch the HomePod is firmly mono, though its ability to diffuse sound evenly throughout a room is impressive. While the HomePod will sound sweet to everyone, only those in Apple’s ecosystem can easily play music to it. With no Bluetooth or line in, there are two ways to get your musical choices on it: ask Siri, or stream music to it over AirPlay. Siri will pull music from your Apple Music subscription, if you have one, your iTunes Match account, if you have one, and also anything you've ever bought from the iTunes Store. Airplay is Apple’s proprietary local streaming protocol and is available on iOS mobile devices. You can use AirPlay from iTunes on a Mac or Windows PC, but clearly that is not a mainstream way of listening to tunes these days. There are certain unofficial ways to get AirPlay on other devices, such as DoubleTwist on Android, but Apple's tendency to constantly tweak its apps will break this support every so often. With an iPhone or iPad you can play absolutely anything to the HomePod via AirPlay, making it more flexible than a lot of other Wi-Fi speakers. So if your family is all Apple, great. If you have an iPhone, but your other half doesn’t, that’s a bit more awkward. Of course, Apple's preferred solution is that you subscribe to Apple Music, and then control it via Siri. Users of Spotify, Amazon Music et al cannot do the same. Still, if you are all Appled up, the HomePod is as slick to use as you’d hope. AirPlay is quick to respond and more reliable than in a lot of third-party speakers, and even if you’ve used Siri to play music, its playback can then be remote controlled from an iPhone from the ‘Now Playing’ Control Centre widget, letting you adjust the volume, pause and skip tracks. That volume control is handy because while you can tweak the volume on the unit, asking Siri remotely to set the volume to a certain percentage is a bit of a crapshoot if you don’t know what percentage it’s already at. The volume slider offers context. You can also ask Siri to just turn it up or down, which is what we settled into using mostly. The technical portion of Siri is really solid – its ability to pick up your voice over music or other noise is top-notch. It’s done a good job of understanding our commands during our time with it, too – no major idiocy in the requests so far. But then, that might be because it’s quite limited, and so we’ve only been asking it limited things. In practice, you may find some of these abilities a bit hit and miss. When I asked it for a station tuned to my tastes, it gave me New Order and The Cure who I've literally never listened to on Apple Music – nor any of their obvious contemporaries. So where that was coming from, who knows? I do listen to ’80s-inspired electro-pop from current artists a lot, but I'd really expect more of that from new bands, rather than leaping back to the actual ’80s. We tried asking it to play some Nirvana, and it led with School, which is not exactly the instant, recognisable hit one might expect. Asked for “popular Nirvana songs”, Siri played Love Buzz. Truly, the popular Nirvana hit we were all expecting. So we just went simple and asked for Nirvana’s MTV Unplugged album, which is on Apple Music. Siri gave us Now That’s What I Call Music 98. Okay, most other things we asked for, whether individual songs or albums, Siri delivered but clearly it's not flawless at present. Apple Music also has a huge library of podcasts available to it, but if you don’t use Apple’s Podcasts app, its lack of syncing with what you’ve heard before can be a bit of a pain. If you’re up to date, being able to just ask for the latest episode of something is nice, though. Siri has other problems. It can read your unread text messages out, send messages you’ve dictated, set timers and alarms, and create reminders… but these all have one flaw or another. The messages feature is bizarrely privacy-compromised for a company that prides itself on being a leader in this area. If you’re at home with your phone, anyone can ask to hear the messages, or dictate a new one. And remember, Siri is very good at picking up voices, so don’t expect walls to protect you if they’re thin. You can of course just take the nuclear option and turn this feature off, but that also turns off the reminders and lists option. Maybe that’s not a big loss, though, as these suffer from the fact that HomePod only recognises one iCloud account. It desperately needs multi-user support, or at least voice recognition to limit someone who’s not you messing with your stuff. It won’t let anyone use these features if you’re away from home with your iPhone, but if your iPhone is on the same network, it’s a free for all. Considering that Apple already has voice security built into the ‘Hey Siri’ feature on iPhones, its omission here is just strange. The timer's function has its own problem: you can only set a single timer on it. Okay most of the time, but really it should have the ability to set multiple timers, ideally that you can name, as on Amazon Echo. Siri can also tell you measurement conversions. If Apple sorts out the timers and adds some kind of recipe support in the future, Siri could be a handy kitchen companion. You can also ask Siri for weather and sports scores/schedules – standard stuff it can do on the iPhone, and of course, it'll handle smart home control, acting as a HomeKit hub so you can control compatible devices even when away from home – this worked really well, although the choice of HomeKit devices is a bit sparse so far, compared to Amazon Echo. One thing you can’t ask Siri to do is to phone someone, oddly – it will work as a handsfree speaker only if you choose that as an option from a call you’ve already made. As good as its voice recognition is, it’s a long way from the flexibility Alexa offers through Skills. Clunky as they can be to trigger, they mean Echos can do almost anything. Siri feels limited by comparison. The Apple HomePod is among the best music speakers you can get, so long as you have an iPhone and, ideally, Apple Music. When it gets the ability to do multi-room and stereo pairing – and we can't imagine that will take long – it'll be even better. If you think of it as a music speaker, with a smart assistant who’s handy for certain things chucked in as a bonus, it is an excellent deal at its launch price. Obviously, if you're an Android user, forget it. If you're in the market for a voice-controlled AI assistant and are not overly fussed about music playback and gleaming audio quality, it's also not for you. And the mid-sized sub-set of iOS-toting people that leaves? We think they'll be more than happy with the HomePod. Which of these high-fidelity audio streamers is the right purchase for you?